Welcome to the world of balsamic vinegar, where balsamic is used to spruce up more dishes than just salad. Balsamic vinegar can be reduced over the stove for a thick, sweet sauce and can even be used as a condiment to make your average sandwich much more flavorful. In this recipe, we chose to coat chicken breasts in balsamic vinegar to give the chicken a sweet, tangy flavor and we paired it with rosemary for the perfect balance of taste. Lucky for you, this recipe is incredibly easy to execute, and in only 30 minutes, you’ll have a chicken dish to die for. Another balsamic vinegar tip: invest in balsamic glaze. It’s a sweeter, more syrupy version of regular balsamic that goes great on salads and meats. Use it in this recipe too. Just drizzle some over the chicken when it’s done, and dig in. 1. Place each piece of chicken in a plastic bag and with a meat tenderizer, pound until 1- 1½ inches thick. *No meat tenderizer? Look around. Use a ladle, hammer, book, anything to pound that chicken down. *Bought thin chicken breasts? No pounding necessary. 2. Coat chicken evenly on both sides with balsamic vinegar. Next, coat both sides with olive oil. 3. Season chicken with generous amounts of salt and pepper, followed by the chopped rosemary. Season both sides. 5. Heat non-stick pan or skillet over medium-high heat. 6. Cook chicken about five minutes on each side, or until juices run clear. Toss the smashed cloves of garlic into the pan with the chicken so it picks up some flavor. 7. Chicken will be dark brown but don’t worry! It’s probably not burned (unless you burned it of course). 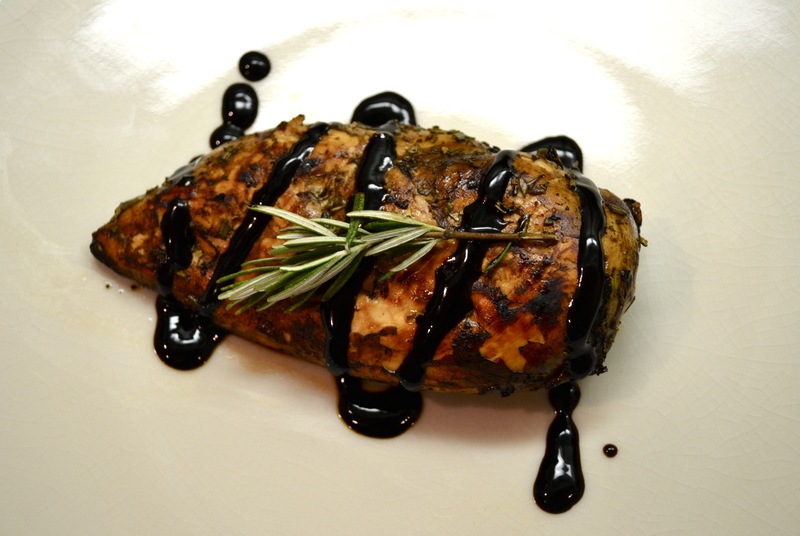 The balsamic produces a deep brown, dark glaze on the chicken as it cooks.